Happy almost-Friday, friends! 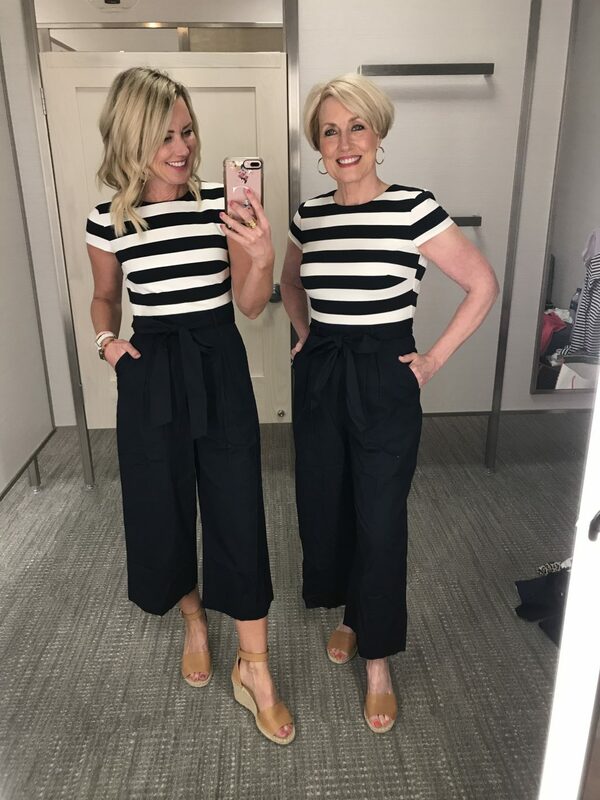 I’m headed to New York City with Mama Sugarplum and Little Miss for a fun girl’s trip tomorrow morning, so you’re getting the latest Dressing Room Diaries post a day early! We are so excited excited to celebrate our sweet girl’s 13th birthday, and have so many fun things planned for her first trip to the city! Thank you for all the amazing ideas you sent my way! We could stay a month and not get to all your favorite personal experiences! I’ll be sure to include them in my recap post on the blog in case you’re planning your own trip to NYC, and you can follow our trip this weekend on my Instagram Story. Also, thank you for the love on this week’s Day to Night Halter Dress and Spring Work & Weekend posts. Plus, our day swimming with the pigs in Exuma! It’s hard to sit on opposite sides of the computer sometimes, so I always love hearing from you! Today I’m excited to share a new Dressing Room Diaries, and it’s a good one with so many great finds for the upcoming season! Plus, Mama Sugarplum is along for the fun! Sidenote: I’m 5’4″ and 120-ish pounds, and usually wear a 0/XS. 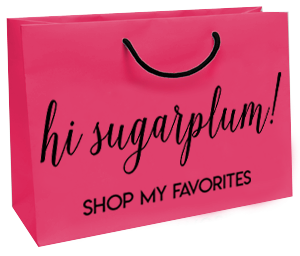 Mama Sugarplum is 5’1″ with an hourglass figure, and usually wears an XS/2p. Let’s start with Mama Sugarplum’s favorite category…tops! This striped top also happened to be one of her fave finds of the week! It’s really thick and sturdy, making it more than a basic tee. The three-quarter sleeves and bateau neck make it a little special, and it comes in so many darling color combos. 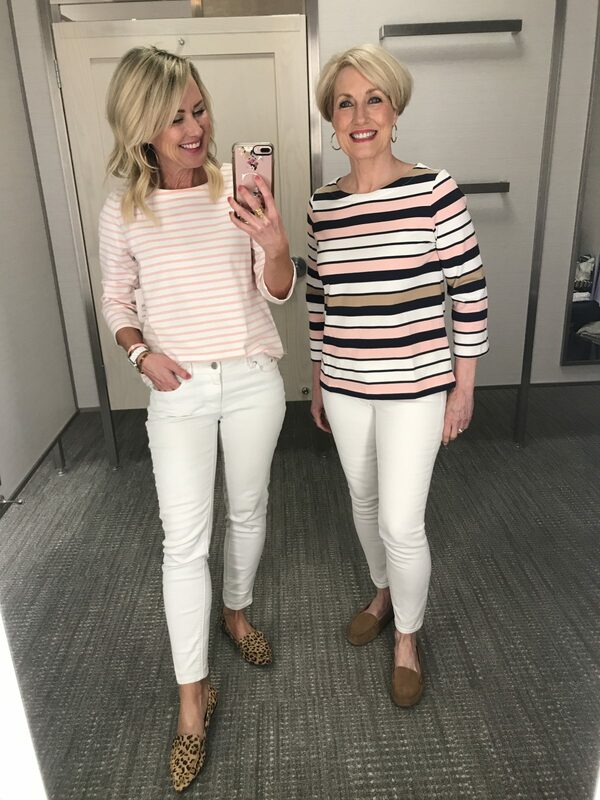 Fit Tip: We’re both wearing a small for a relaxed fit. 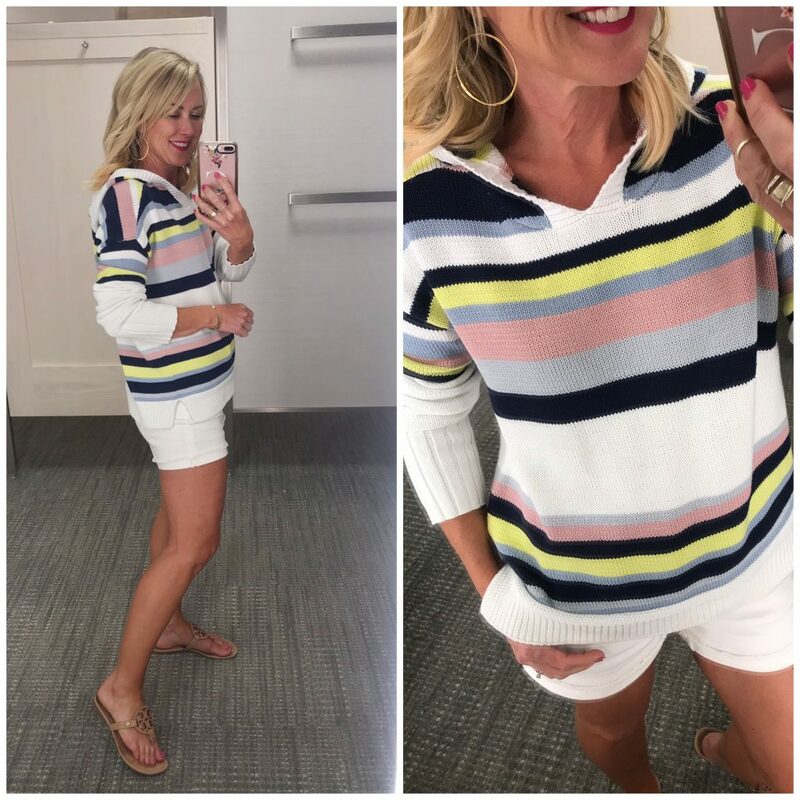 This knit pullover was a favorite on our last DRD (I’ve been wearing it on repeat)…and this week I paired it with the cutest pull-on linen shorts! The dark chambray has the look of denim, so think of them as elevated jean shorts. The waist is stretchy with an adjustable drawstring and pockets. They are linen, so I expect them to get wrinkly, but that’s kind of the style for them. Plus, they have pockets! Fit Tip: True to size, I’m wearing XS in the shorts, but sized up in the top to a small. This cotton sweater is the perfect solution for those of you desperate for Spring styles, but still faced with colder weather. It’s a soft, midweight with a split hem and wide cuffs. The hood gives it a sporty style, and it would be so cute layered over a gingham shirt if you need a little more warmth. Fit Tip: I’m wearing an XS. Size down in the shorts, I’m wearing a 25. Speaking of gingham, layer this cutie under that striped sweater for one of my favorite pattern mixes! This is lightweight, but not sheer…perfect for tying at the waist, tucking, or layering. And who doesn’t love pink gingham? Moving on to more pink, this linen-blend top comes with a tie front and cute drop sleeves with a little cuff. I love the petite collar and little front pocket, too. It’s a little thin, but not so sheer you need a cami. Fit Tip: I sized up to a small. The shirt pre-tied, but you can adjust it for a closer fit. I don’t usually gravitate to yellow (it can be tricky for blondes), but this little ray of sunshine was calling my name! 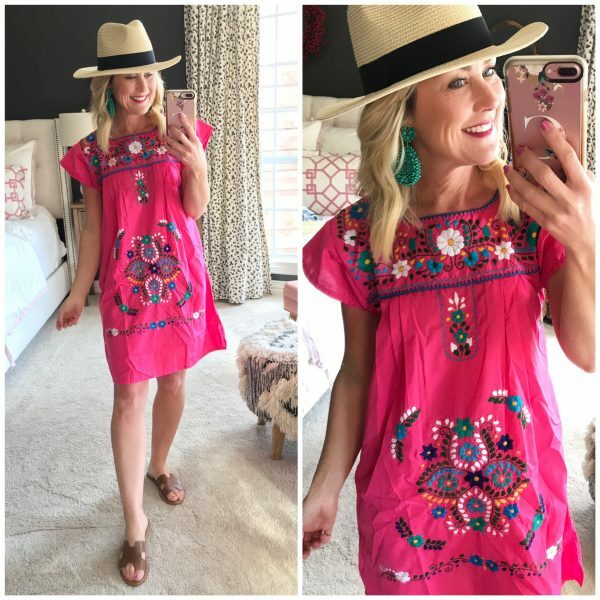 The hue is the perfect shade, and I’m a sucker for flutter sleeves and ruffle details. It has a slight bell shape, but you could still half-tuck it. So cute with shorts or jeans. Fit Tip: I’m wearing a small, so size up one. It’s also a little sheer, but no cami needed. I love red and blue together, so I was instantly drawn to this shirt. It’s a great medium cotton, not too relaxed or stiff, with a slim fit through the torso and shoulders (keeps it really feminine). I’m wearing it now with jeans, and will pair it with shorts later…likely tied at the waist. Fit Tip: I sized up one to a small for a little more of a relaxed fit. This sweatshirt is a great Spring transition piece as well. Wear it now with jeans, and later with cut-offs. 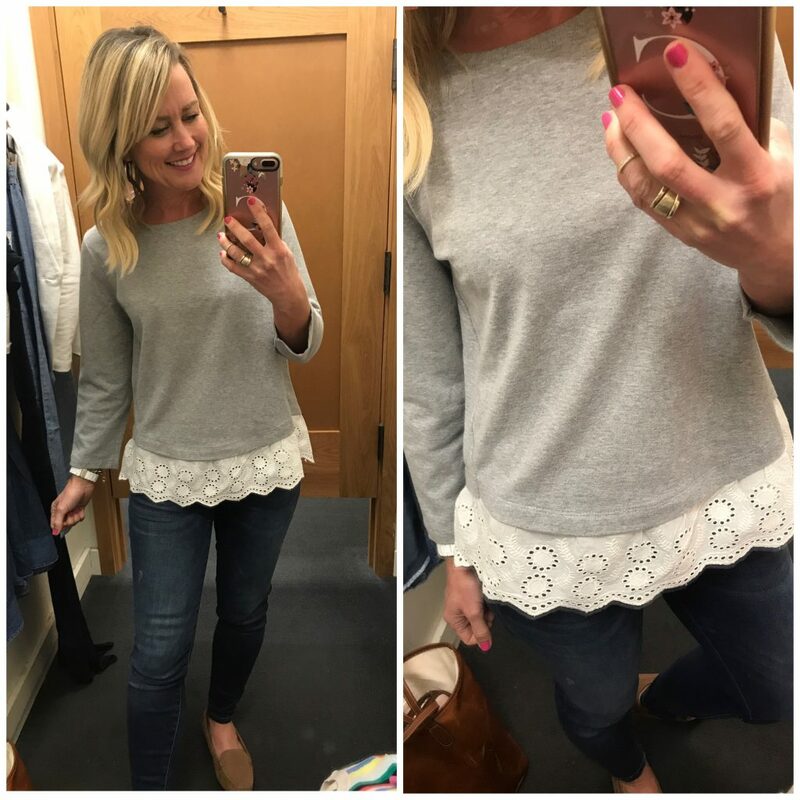 The eyelet trim makes it feminine and a little more special, but it feels and wears like a favorite sweatshirt. Fit Tip: I’m wearing an XS, but size up if you prefer more room. 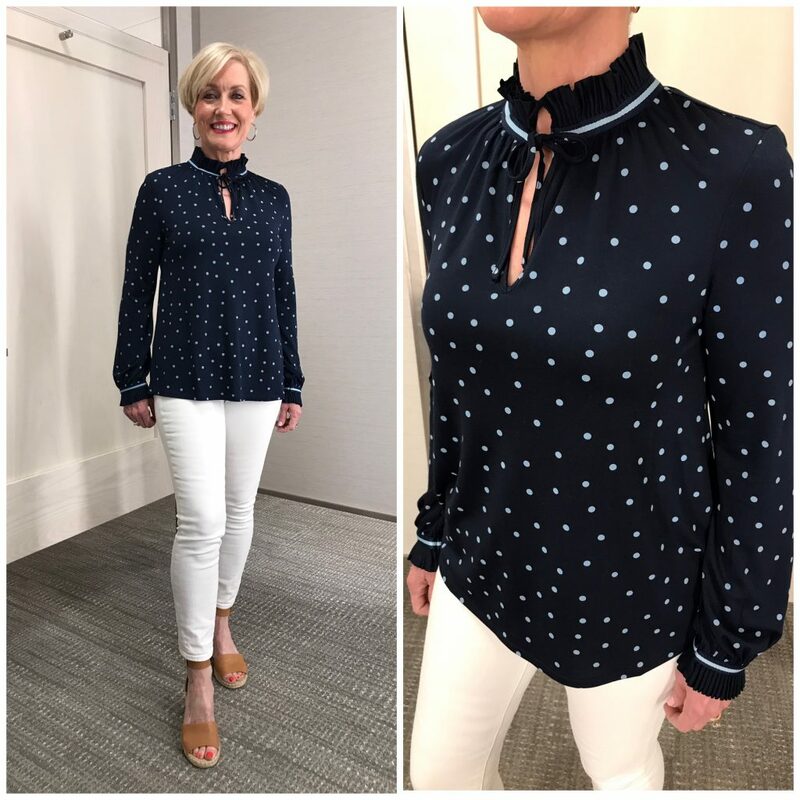 Mama Sugarplum swooned over the color and collar of this blouse…not to mention, the soft drape of the jersey material. The shades of blue are so pretty together (and on her! ), and the pleated collar and cuffs make it a little dressy. Wear it to work, or dress it down with jeans. Fit Tip: This brand is European sizing, so go up one. She’s wearing a 4. 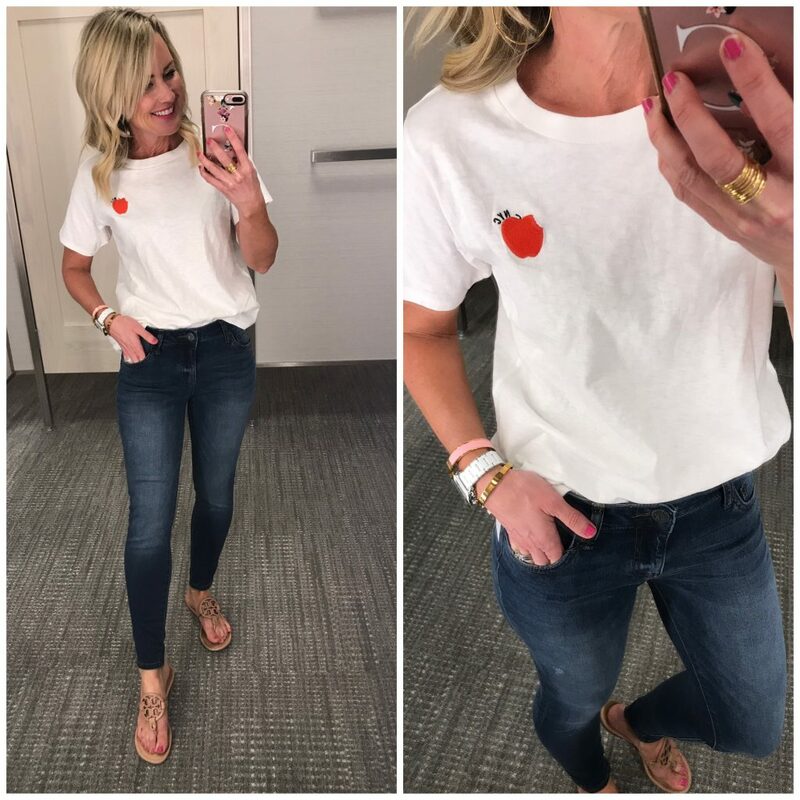 Since we’re headed to New York, it only made sense I needed this cute Big Apple graphic tee! Plus, it’s a super soft and thick cotton, and 50% off! Fit Tip: I sized up to a small for a relaxed fit. 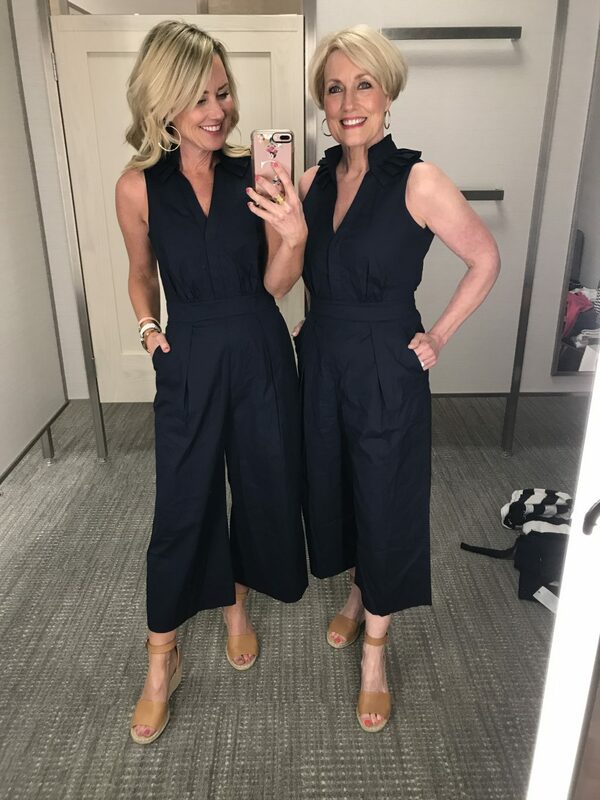 Okay, that covers us for the fun tops this week…let’s chat jumpsuits! Y’all went crazy over the jumpsuit in our last DRD post, so we went looking for more. And WOWZA did we find some more winners! Of course I gravitated to these stripes! The top is a fitted stretchy knit, but the bottom a crisp cotton poplin with wide leg. The tie-waist is incredibly flattering, and it has pockets. Fit Tip: I’m wearing a 0, but would prefer a 2. 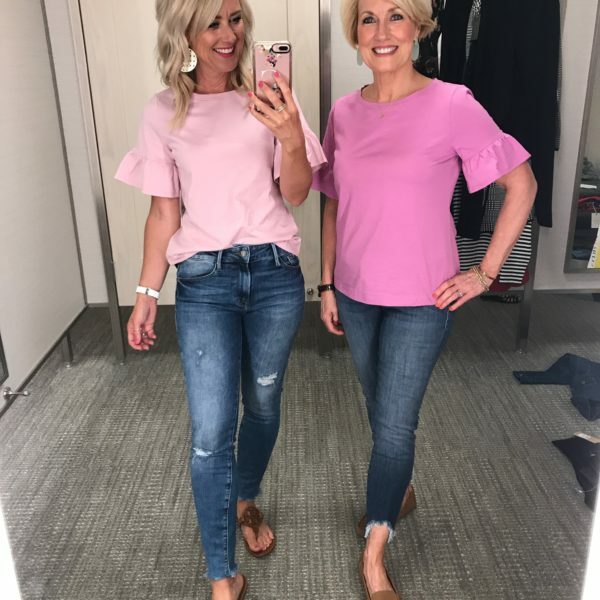 Mom is wearing a 4p…so go up one in regular and petite sizing. Remember this dress from last year? It now comes in a chic jumpsuit! I’m crazy for the taller pleated neck and deep navy. It’s a crisp cotton poplin, but thick with a touch of stretch. So cute with flat sandals or wedges, and a great piece for so many Spring events. Fit Tip: I’m wearing a regular 0. If in-between sizes though, I’d go up one. Mama SP in a 4p. 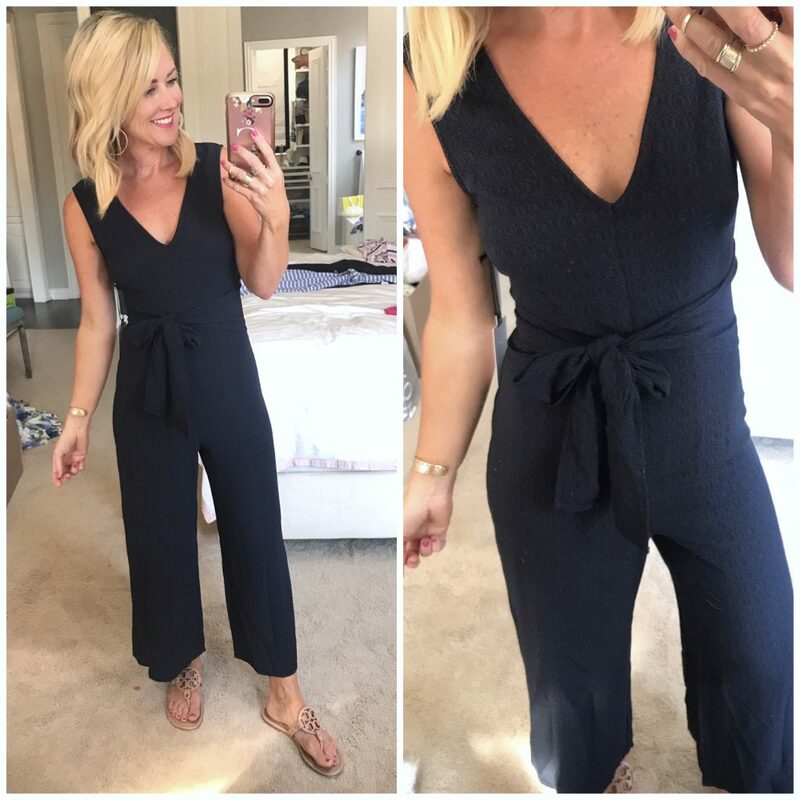 Photos don’t begin to do this linen-blend jumpsuit justice! It is shockingly well-made for the price (under $30! ), and fits so comfortably! It has adjustable straps and smocking across the back for a custom fit, with a flattering nipped-in waist and pockets. The website calls it purple, but it’s more a of light chambray to me. It’s seriously so comfy, it’s like Spring’s version of joggers and a tee. Fit Tip: I sized up one to a small. 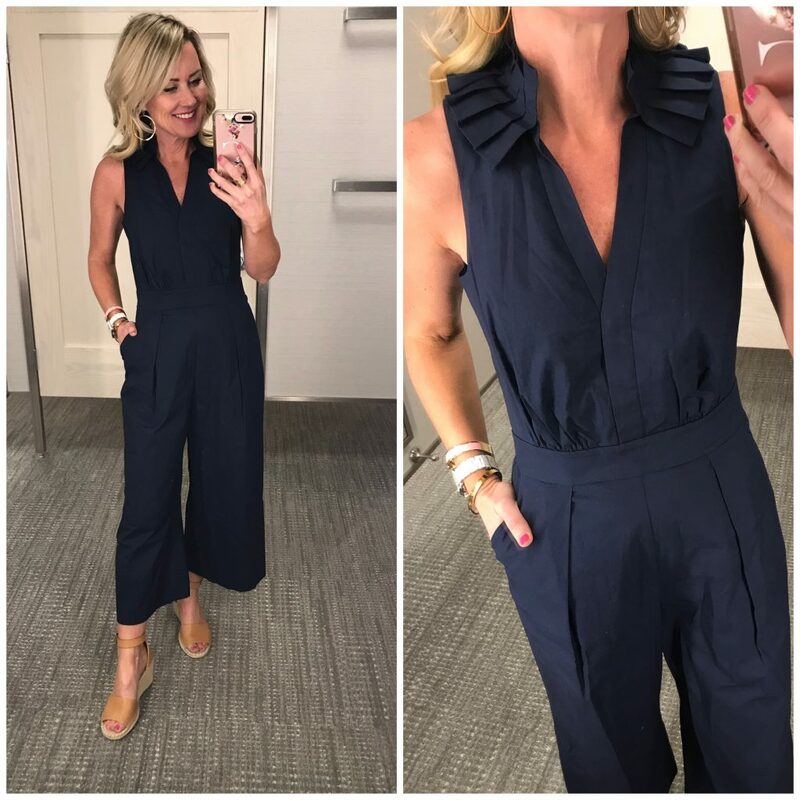 This tie-waist jumpsuit was an instant hit for me…in both the fit and price. In fact, look for it fully-styled on the blog next week! It’s a textured material with a touch of stretch for a figure-hugging fit, and a touch of silk for a luxe finish. The sash can be tied in the front or back, giving you multiple styling options, and it comes in several great colors. The only downside is no pockets, but that also allows it to lie flat against your hips. Fit Tip: True to size, I’m wearing XS. 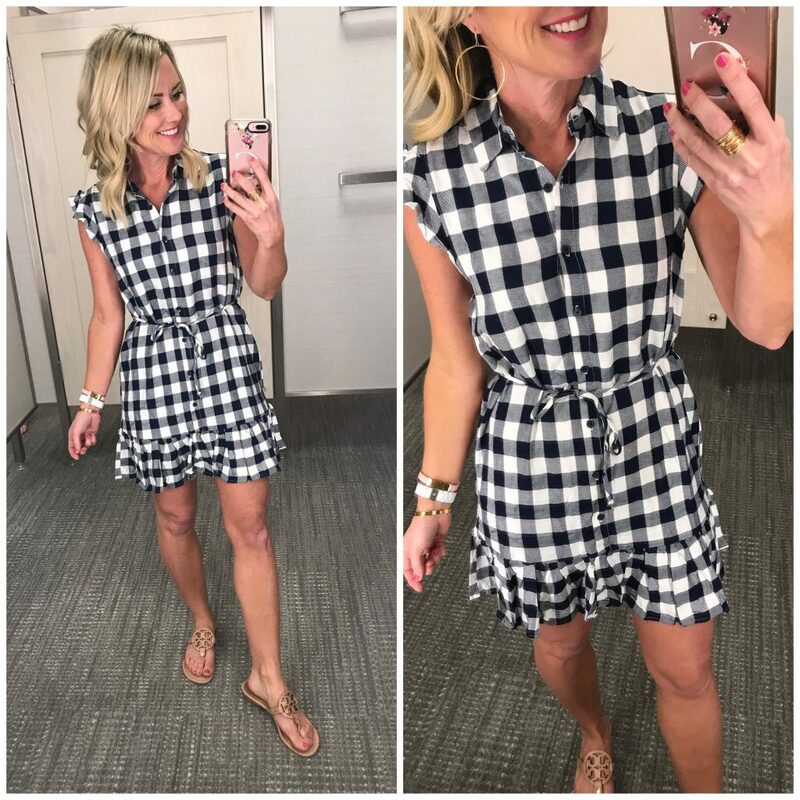 Pretend this jumpsuit is steamed, and overlook the shenanigans behind me…this gingham jumpsuit is DARLING!!! It was an instant hit for me, and I was immediately sad the weather in NYC wouldn’t accommodate it! The cotton is soft and lightweight (not as sturdy as the other jumpsuits shown), but not sheer. The neckline is so flattering, and a great balance to the wider legs. Wear it like you would a sundress to all your fun Spring and Summer daytime events. Okay, let’s chat dresses and skirts! 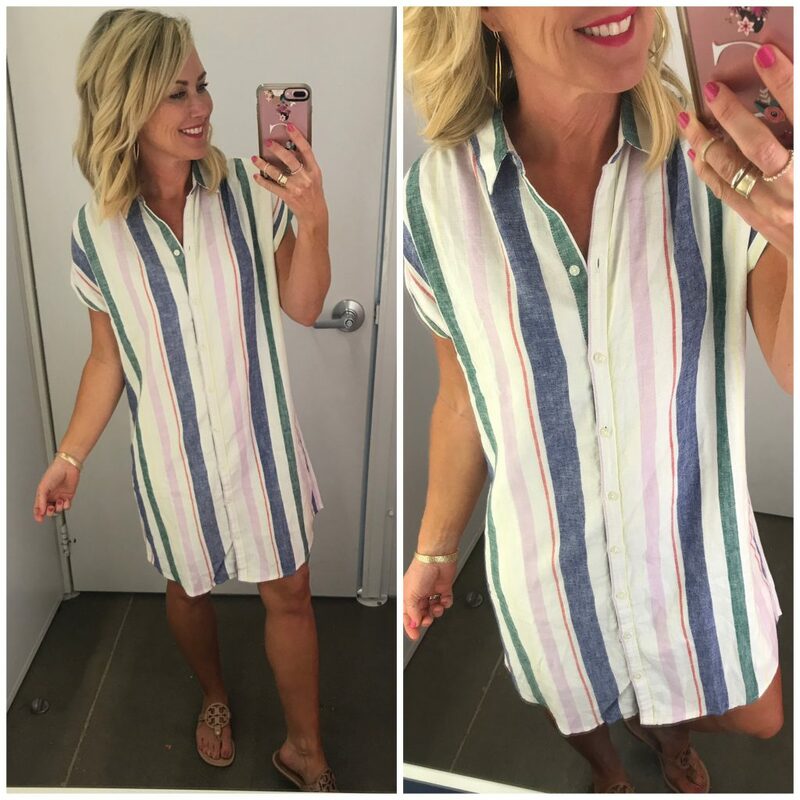 This linen-blend shirtdress was another pleasant surprise! The material is a great mid-weight, and it comes with a built-in slip for full coverage. 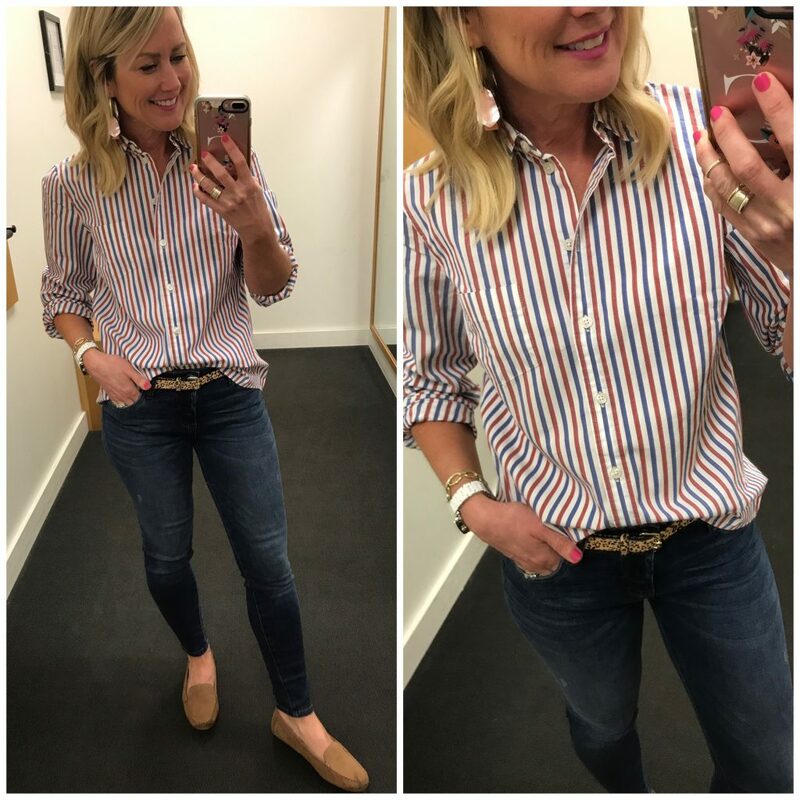 I love the little drop sleeve with cuff, and petite collar, and a total sucker for the multi-colored stripes. Fit Tip: I’m wearing an XS shirt and regular 0 skirt, but would prefer the length of a petite. This gingham shirtdress is fun and flirty, with a tie-waist and ruffle trim sleeves and hemline. It’s a little thin and short for my comfort level, but too cute not to share for the petite crowd! Fit Tip: I’m wearing a 4, but would prefer my usual 2…so I’d say it’s true to size. This classic fit-and-flare has gorgeous box pleats, and fun cut-out at the hem. The silhouette is flattering and modest, it’s fully-lined. Good white dresses aren’t easy to find, and this is definitely a winner! Fit Tip: Fit Tip: I’m wearing a 4, but would prefer my usual 2…so I’d say it’s true to size. Fit Tip: I’m wearing a 4, but would prefer a 2. We’re almost to the end…are you still with me? 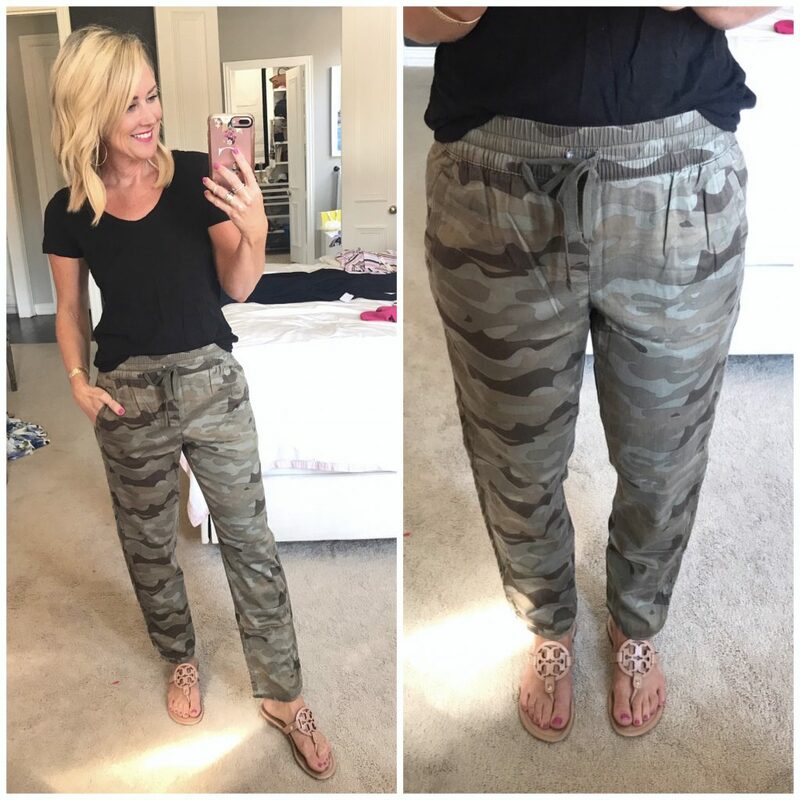 GOOD, because you don’t want to miss these pants!! I don’t know how to adequately describe the fabric…it’s not knit or twill, but rather a soft, brushed blend that’s a great mid-weight, hangs well, and is cool against the skin. The wide elastic waistband is comfy, and the ankle has a bit of a tulip hem for a little kick. Just trust me on these, you’ll want them for travel and running around! They come in several neutral solids if camo isn’t your jam. In fact, this is likely going to be my travel outfit tomorrow! 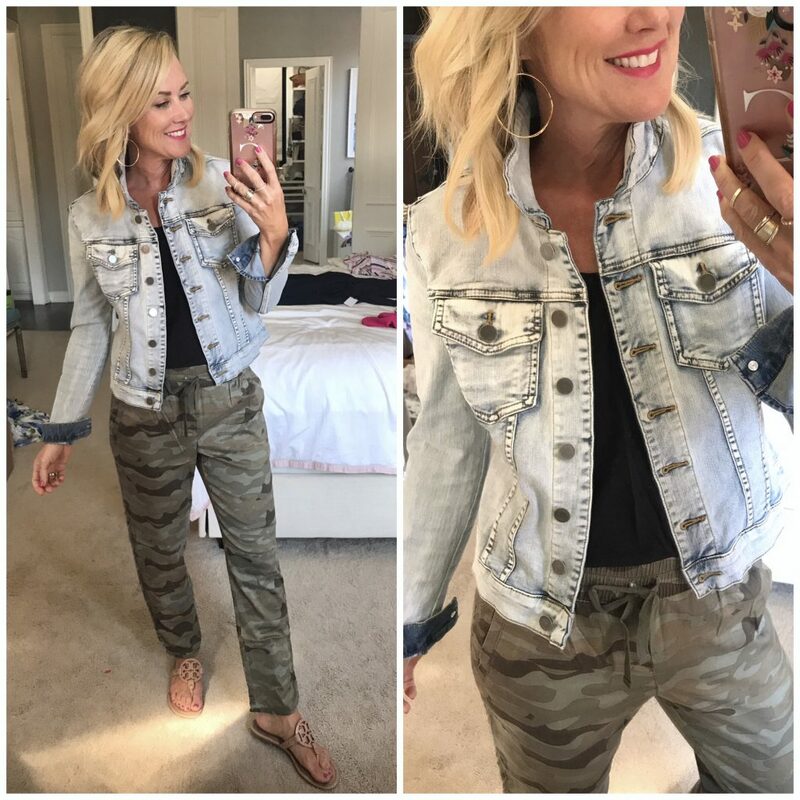 You know how much I love my Kut from the Kloth jean jacket, with its stretchy, fitted perfection…so of course I had to try this lighter wash! It fits just as well, with a great wash perfect for spring and summer. The shrunken fit and slim shoulders make it great for pairing with skirts and sundresses, too. Fit Tip: I’m wearing an XS, but size up one if you plan to wear it over anything but tees and tanks. I know you love seeing the swimsuits, but truthfully this is the only new option worthy of sharing this week. And in fact, I shared this exact suit in this post, but wanted you to see this new pinkish-red shade. 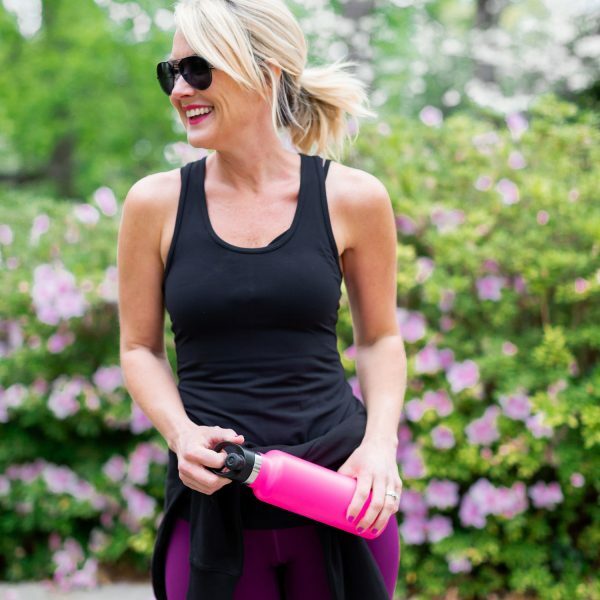 It’s super sturdy with lots of support and coverage, but still effortlessly chic. In fact, I wear it as a tank with shorts when on vacation! Fit Tip: I size up one in swimwear, and am wearing a 4. Technically this cute tie-front jumper belongs with the jumpsuits above, but it’s actually better suited (and much cuter!) as a swim cover! The material is soft and thin with great drape, and the tie-front creates a little peek of skin. So darling, but better for the pool! 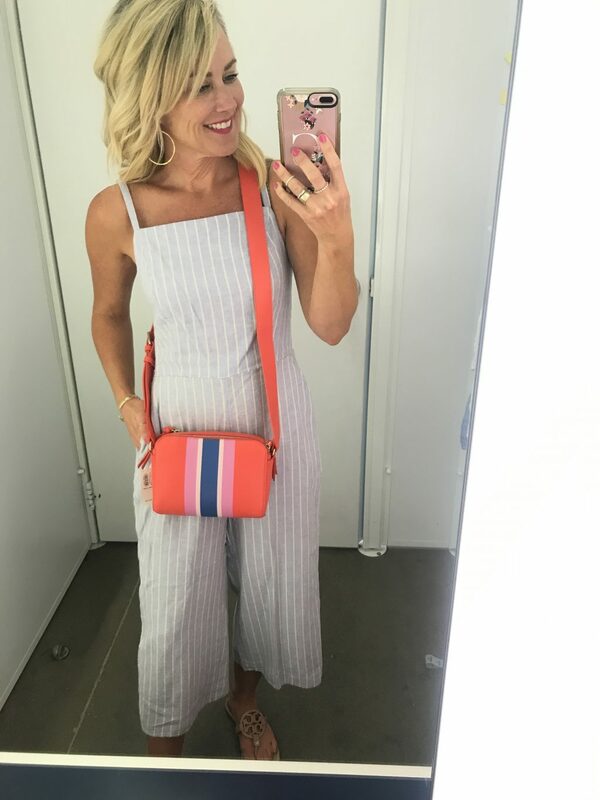 And finally, I found a few amazing accessories I want to share…starting with this fun color blocked crossbody bag! It’s faux-leather with the cutest stripe combo, and a great size for Summer. Perfect vacation travel bag! And remember these slides from earlier in the post! I literally stopped and gasped when I spotted them! I wear such neutral shoes, I forgot how darling and fun they can be! 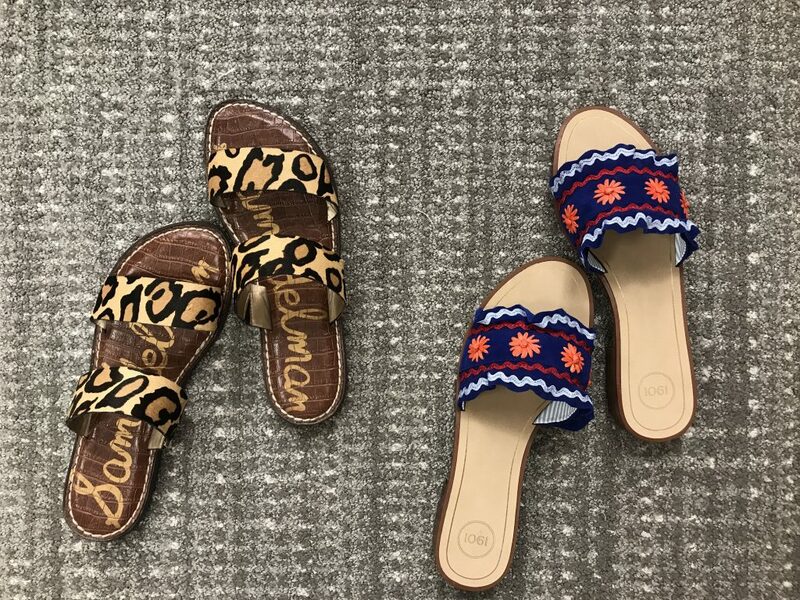 Cheers to sandal season and fun shoes again, am I right!? The leopard will be definitely be in heavy-heavy rotation for me for the new season! (I wore my leopard flats non-stop all Fall and Winter!) These are actually comfy with a soft, padded footbed, and bendable straps. And we all know leopard is a neutral! Fit Tip: I needed to size up half for more length in the sole. Okay, that’s it for today, I hope you found some new goodness! 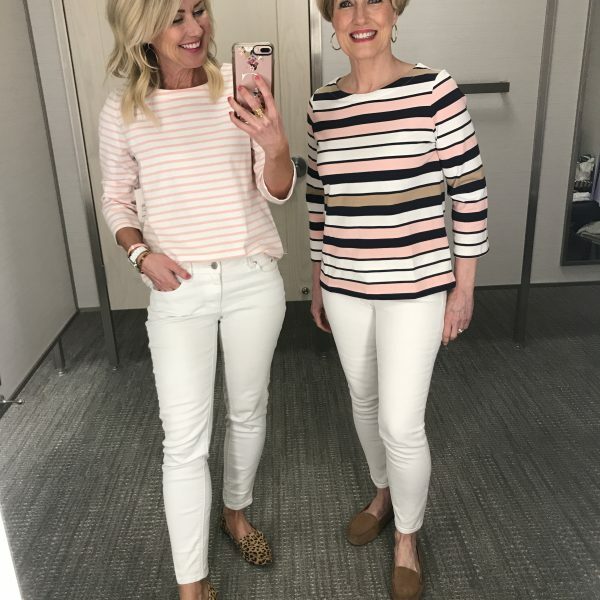 And if you missed our last installment of Dressing Room Diaries, check it here…it was our most popular DRD ever! These ankle jeans and these high-waist jeans tied as the overwhelming favorites, with this striped knit dress a close second. And if you’re looking for Amazon finds, check out my March Fashion Faves here. What’s your favorite from this round of Dressing Room Diaries? What categories do you like seeing most…or would you like to see more of?! I got you, girl! Happy weekend, lovebugs! PS…Notice my “tan”? Yep, it’s this stuff I talked about in my latest Sugarplum Top Five! I have that pink swimsuit and I get a TON of compliments on the color and style. I am a size 10, so it works on a nice size range. I hope you make a little time for the newly opened Hudson Yards and get a moment to walk on The Vessel, the new pedestrian walking spot in the center of The Yards! It’s a must see! Please share the size you are wearing for the jumpsuits, as well as how easy they are to take off. I find that some jumpsuits are difficult to remove when in the restroom. I love all your posts but especially dressing room diaries and live try on sessions. Even better when Mama Sugarplum is included. Speaking of MS, she’s looking especially fit, trim and fabulous. What’s her secret? (I say this but she’s always looked fabulous). I can’t wait to see your NY styles, including Little Miss. You seriously are so stinkin’ cute! You look adorable in everything. Have so much fun with your girl!! 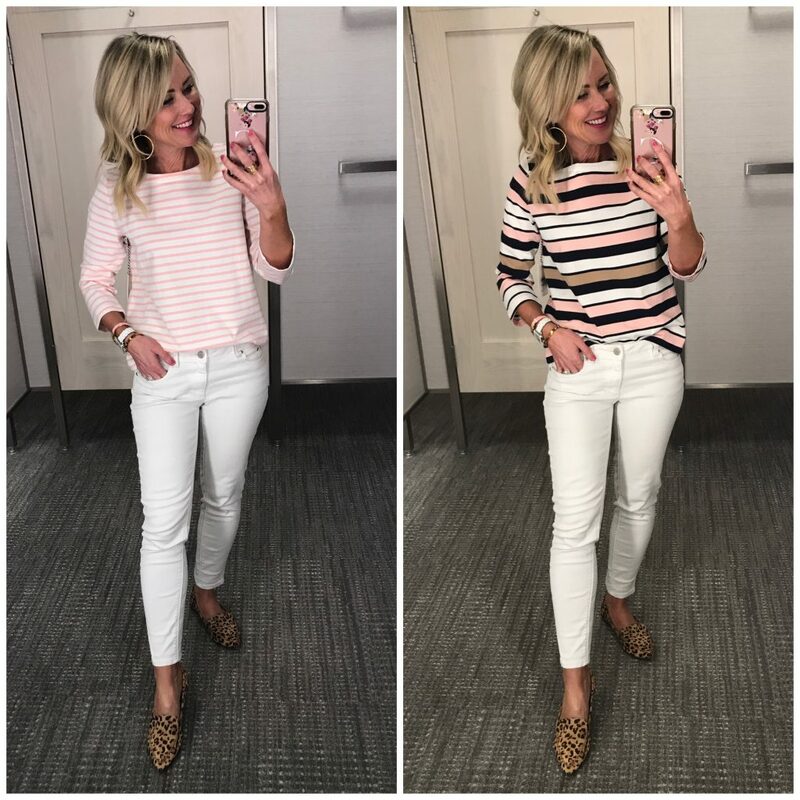 I grabbed that pink stripe top and love it. I’ve grabbed La Blanca swimwear for years and am always happy with the quality. hmm..do I need a new suit?!! Everything is so cute!!! I almost bought the Boden top yesterday…now I wish I had! It looks so cute on your mom! 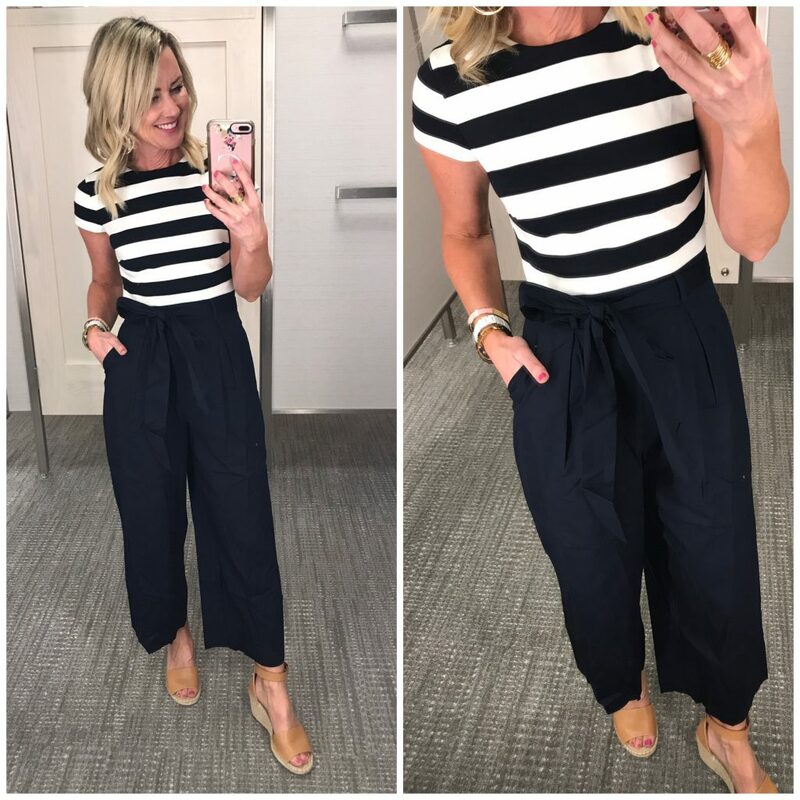 I did purchase the Old Navy jumpsuit the last time I was in the store…adorable! Love your try ons! You have great style! 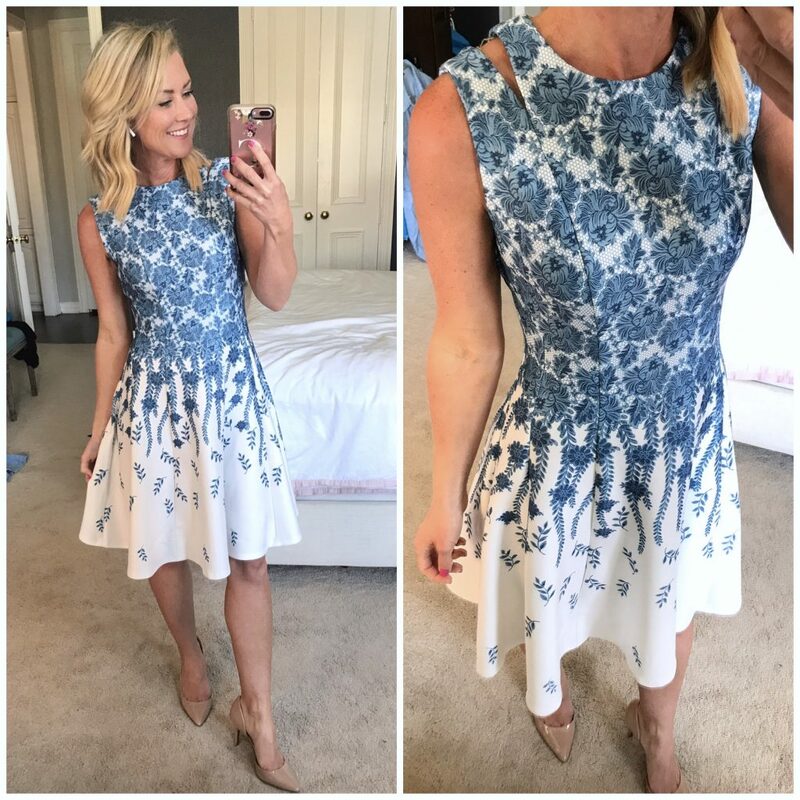 I ordered the blue and white fit and flair dress with the cute shoulder detail. I have several special occasions coming up this spring and summer and I need some cute dresses. Have a wonderful time in New York City with your daughter and mom!